The Seaport project calls for a Spire that would carry visitors 500 feet above the city to enjoy views of the bay. Plans also include an aquarium, hotel, restaurants, a public market, shopping, and parks with views of San Diego Bay, tidal pools, oyster beds and a public swimming venue. Board of Port Commissioners will evaluate local developer’s pitch to enhance San Diego waterfront. SAN DIEGO — The Port of San Diego’s desire to make California’s second largest city a world-class destination could come with a hefty price tag considering the Board of Port Supervisors favor a plan featuring a 500-foot tall Space Needle-like structure, a Smithsonian-inspired aquarium, restaurants, shops, hotel space and recreational boating opportunities. Port commissioners directed staff on July 13 to enter into exclusive communications with Gafcon/Protea Waterfront Development (PWD) during the next three months to redevelop and revitalize a portion of the San Diego waterfront. Commissioners will be updated on the progress of discussions on Oct. 13. Gafcon/PWD beat out five other proposals, all submitted in June, in gaining the port’s favor. The other proposals were not eliminated by the board’s direction; any of those proposals can become favored should discussions with Gafcon fall flat. Yehudi “Gaf” Gaffen, CEO of San Diego-based PWD, said the port’s ambition to establish the local waterfront as a world-class destination would help San Diego rival Los Angeles, London, San Francisco and Sydney, among other cities, as an identifiable attraction. Building “Seaport,” Gaffen said in his proposal, would help achieve that goal. “Sydney has its Opera House, London has the Eye and even South Boston transformed its downtrodden waterfront into a world-class destination. It’s high time for San Diego to shine with a beacon of its own,” Gaffen said in his proposal. “Seaport will look to the future with an iconic aquarium, while paying homage to the rich heritage of San Diego with a vibrant fishing harbor. “While our sister cities of L.A. and San Francisco continue to evolve culturally on a global scale, it’s imperative San Diego embolden its footprint as a viable player—and celebrate its position as California’s point of origin,” he continued. A signature of the Gafcon/PWD proposal is the 500-foot tall “Spire,” which would be one of the most identifiable structures on the San Diego skyline. Visitors would be able to visit the top of the structure and enjoy views of the city similar to the Space Needle in Seattle or the Washington Monument in Washington, D.C.
“Consider Seaport’s visually arresting Spire as the starting stake in the ground, opening the gates to explore our great state,” stated Gaffen. Visitors would pay $17 for entry into the Spire, according to the proposal. 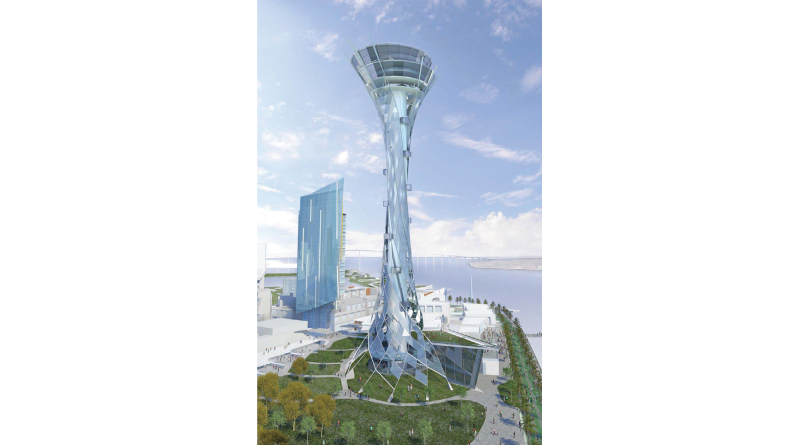 “The Spire [would carry] locals and visitors 500 feet above our city to enjoy the breathtaking views of the bay that have been available previously only in expensive private apartments, offices or hotels,” Gaffen stated in his proposal. Gaffen added the Seaport project would positively enhance boating and fishing activities in San Diego Bay. “Often overlooked, the 30 acres of water at Seaport will bring significant ‘added value’ with improved facilities for the fishing fleet, new and improved marina slips, the addition of state-of-the-art megayacht berthing facilities, and dock and dine public piers,” Gaffen stated. Boaters would have access to 164 slips. Plans also call for an aquarium, hotel, restaurants, a public market, shopping, and parks with views of San Diego Bay, tidal pools, oyster beds and a public swimming venue. The final budget is still a work in progress but news reports indicate the Gafcon proposal would cost at least $1.5 billion. Port staff stated in its request for proposals any plans to redevelop the San Diego waterfront must incorporate a variety of uses, boast “exceptional” architecture and serve as a destination for recreational activities. Amen, Mr. Gaffen. San Diego boaters NEED ACCESS TO DOWNTOWN. I welcome both the landmark spire and the plan to include public docks and slips in this project!